Today when we think of Ilocos region, we think of windmills dotting a quiet shoreline and tranquil surf spots. We imagine baroque churches and old historical towns with calesas crossing its cobblestone-streets. We remember national heroes and former presidents of the country. We look forward to buying abel iloko or chichacorn. We guarantee that if you join a TRIPinas Ilocos tour, not only will you get to realize all of those above, we will also make sure that you get a better appreciation on the Ilocano people. We're excited to present two of our incredible packages that are guaranteed to be family- and barkada- approved. Our 2D/1N Vigan trip has an added bonus of a beach side trip to La Union and our 3D/2N complete Ilocos tour takes you both to Ilcoos Norte and Ilocos Sur so you can see not only the cultural side of Ilocandia but also its laid-back coastal towns, too. Hilights : Leisure walk at the historical Calle Crisologo, stuffing self with scrumptious empanadas and riding the waves of La Union. 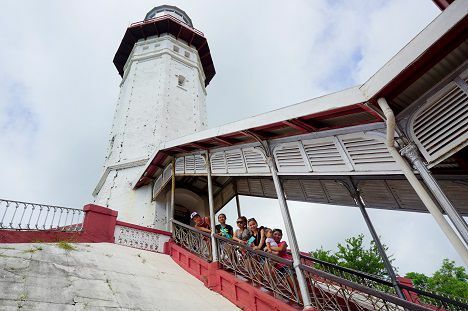 This 3 days/2 nights takes you to the white sand beach of Pagudpud, the imposing 20-windmill farm of Bangui, the creamy white rock formations of Kapurpurawan, the winding viaduct of Patapat and the towering lighthouse of Cape Bojeador. After visiting the north, the group will be brought to the southern part of the region for a historical and gastronomical extravaganza. Take a trip down memory lane as you stroll the cobblestone alleys of Vigan City, visit the old Baroque churches, Malacanang of the north. Don’t forget to sample their famous bagnet and empanada. Before going home, make sure you have some inabel Iloco for pasalubong. RATES: The price depends on the number of people in your group. To give you an idea rate is Php2,699/person if you are 13 people. If you are only 4 people rate is Php6,250/person. Please inquire with your tentative headcount to know the corresponding rate. 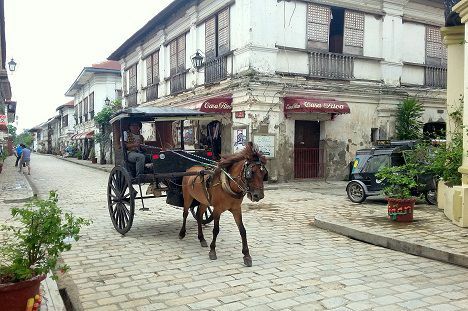 TRIPinas will take you back in time with a guided historical tour of Vigan City, one of the country’s World Heritage Site. 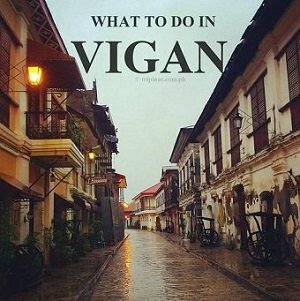 We’ll sample the popular and uniquely Bigueño dishes like bagnet, empanada and longanisa, have a go with pottery, visit churches and museums, and buy loads of inabel iloco. You need a little adrenaline before returning to Manila? Fret not as we’ll drop by San Juan, La Union to catch some waves. It’ll be an overnight tour of history, gastronomy and adventures of epic proportions. The topography of the region makes it a good stage for all sorts of exhilarating adventures like sandboarding at the La Paz sand dunes in Laoag, surfing the waves of Pagudpud or that of San Juan in La Union and hiking Mount Tirad. If you need an adrenaline rush, Ilocos region will not disappoint. If you're looking for a fascinating culinary experience, the Ilocanos boasts of unpretentious, simple but extremely tasty dishes your tongue will ever encounter. Bagnet, empanada, dinengdeng, pinakbet, poqui-poqui, warek-warek, buridibud. You can already work up an appetite by just saying these dishes names. History and culture is a way of life here. Art is manifested through their weave, churches and pottery. The Ilocos Region, also known as Region I, is situated between the West Philippine Sea, CAR, the Cagayan Valley and Central Luzon. It was originally composed of Ilocos Norte, Ilocos Sur, La Union. Pangasinan, which used to be part of Central Luzon, was only included as part of Region I on 1972 during the time of the late President Marcos. The primary language is Ilokano, followed by Pangasinan then Tagalog. There's this stereotype that Ilocanos (i.e. the people in this region) are much more careful about spending money, hard-working and close-knit compared to their brothers in Luzon. They're also noted to be extremely loyal and brave, and are able to withstand hardships for longer periods of time. Perhaps there is some to truth these claims if you put it in a context that considers their land's geography. If one factors the limited area for agriculture in Ilocos Norte, Ilocos Sur and La Union, one will see that food production is a real issue. So they are, in a way, forced save as much as they can and find other sources of income to make ends meet. They found these options in spinning and dyeing yarns, weaving blankets, etc., and making clay pots. Read our thoughts on how people are the reason why a destination is worth of interest. "Though I cannot fault people from associating the windmills, white beaches, Baroque churches and cobblestones of historic past to Ilocandia, Ilocos to me will always be about its hardworking people who know how to appreciate the simple joys of life. I am drawn by their dark skin not because it is also my coloring but because I know that their color is a product of diligent work - endless hours of toil under the scorching sun, baking their skin to plant tobacco. I am intrigued by the lines on their hands, a product of complicated hand weaving to make the world-famous inabel that most people in the city adorn their dining tables with. It is fascinating how they are able to make very simple yet tasty dishes most people have dismissed as peasant food in the past yet a quick survey in the menu of most Manila Pinoy restaurants would indicate that these dishes now command a good cost on the table. I guess I like that their life is a lesson lived and shared to all those who cared to learn --- that even though you cannot change the cards that you are dealt with, if you ever so patiently learn how to play the hand you'll end up with something worth admiring."